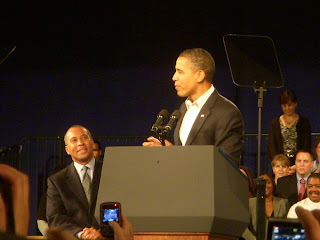 Over 10,000 enthusiasts like this CSfC'er came out on Saturday to rally for Governor Deval Patrick, and to see special guest Barack Obama. Refrains from Sen. John Kerry to singer James Taylor of "17 days" made it clear that November 2nd is almost here - we need to act now! Eastern Massachusetts has the weight to ensure that Deval Patrick wins on Nov. 2nd -- it's those who plan to stay home on Nov. 2nd who need to hear from us. So let's Get Out the Vote!! President Obama stoked the crowd with his analogy of inheriting a car in a ditch. "John Kerry, Ed Markey, Deval Patrick, we put on our boots and pushed and shoved that car while the Republicans looked down at us, fanning themselves and sipping Slurpees, not willing to lift a hand to help," he said, to shouts of "That's right!" "Once we finally got the car onto to firm solid ground," he went on, "they say, 'great job.. can we have the keys back now?' No way! They can come along for the ride, but they gotta sit in the back this time! Everybody knows, if you want a car to go forward you put the car into D for Drive. If you want to go backwards to where you just came from, you put it into R for Reverse!" Yup - put me down for D on Nov. 2nd. 0 Responses to "POTUS Stumps for Patrick"